We all know what debugging is – stepping through running code, line by line, inspecting variables and trying to figure out what’s wrong with your program while simultaneously tearing your hair out. However, usually when debugging Python code, the Python process is running locally on your system. What happens if you want to debug through code running on another server? This is typically the case when working with OpenStack Swift, since the Swift-all-in-one (SAIO) instructions tell you to use a VM to run your Swift installation in, and a Vagrant VM provided by SwiftStack simplifies this. However, this means that the Swift code is not running locally; it’s running inside of your VM – so how do you debug into it? 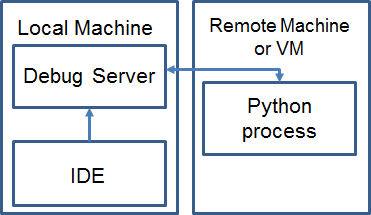 Remote debugging aims to solve this by allowing you to inspect, trace and step through code running in a Python process on another machine. Setting this up requires some work, but is well worth the effort when debugging a non-trivial application running on a remote server or VM. For those of you from a Java background (like myself), remote debugging into a JVM is almost second nature, as usually you’re working with application servers/containers that run in a separate VM. In the case of Java, the typical remote debugging workflow had your IDE as the debugging client, and it connected to the remote “debug server”, which ran in the same JVM as the target code, and was enabled using the JVM debug options. 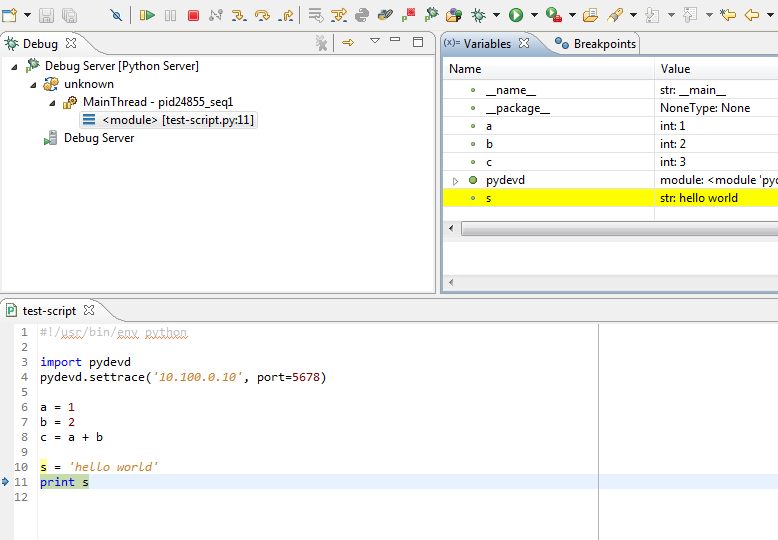 For remote debugging in Python using PyDev, the roles of client/server are somewhat reversed. 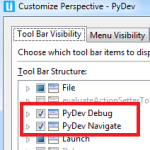 For PyDev remote debugging, the debug server runs locally and is started by your IDE, and the remote Python process that you wish to debug acts as a client to connect to it. This means the target code that you want to debug must be modified so that it connects to your debug server. I’ll be using LiClipse, a version of Eclipse that comes with PyDev pre-installed for this tutorial. I realize that Eclipse and other “heavy” IDEs aren’t that popular for Python development, however I’ve found LiClipse (via the PyDev plugin) to be quite useful for Python work. 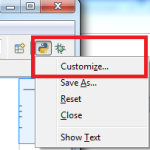 If you already know how to use Eclipse/LiClipse, you can skip this section. Note that you will need to have at least Java 7 installed since LiClipse is based on Eclipse, and Eclipse requires a JVM to run. 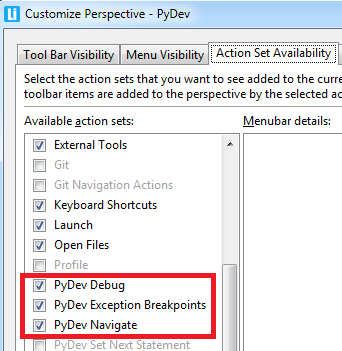 – Action Set Availability: Ensure all “PyDev*” entries are checked. 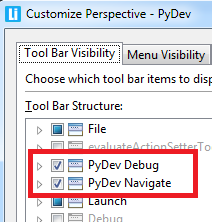 – Tool Bar Visibility: Ensure all of “PyDev Debug” is checked. When asked for a Python interpreter, clicking auto-config should work. If it doesn’t, then will have to point to your Python installation, i.e. where your Python binaries are. You should then see the Swift git checkout in the PyDev Package Explorer Window. 1. The Debug Server runs locally, i.e. on your developer machine. 2. The code you are remotely debugging must connect to this debug server. 3. After that, you are able to debug, trace and inspect code running remotely. Because your local machine acts as the debug server, you must know its IP address so you can connect to it in step (2). If the remote code is running on a physically different server than your local machine, then you just need to know your local machine’s IP address. However, if you are running a VM, as is recommended in the Swift-All-In-One instructions (and provided by the Vagrant SAIO), then it’s bit more complicated. In this case, the “remote” server is a VM running on your local/host machine. In this case, you should use the IP assigned to your local/host machine from the Virtual Machine Provider’s adapter. This is a virtual adapter that acts as a sort of bridge between your host machine and the virtual machine. You can use your local machine’s “regular” IP address, but it might change (due to DHCP), while the virtual adapter IP address should not. In both examples above, the local/host machine IP is 192.168.8.1. Yours may be different. Remember this IP address, as you will use it to connect from the remote Python process to the debug server on your local machine. 2. Allow access through local Firewall if prompted. This is the default port; you can change it in LiClipse Preferences. 4. Allow network access if prompted by OS/security settings. – You can switch back to normal Python view using the buttons in the upper right corner. – Here you can see the call stack, variables and their values and other state of the running program. This copies the pysrc folder over to a folder named pydev on the VM. Create a script at ~/test-script.py with the following contents, but replace <YOUR LOCAL MACHINE IP HERE> with the IP you found above. In my case, it was 192.168.8.1. Try the VirtualBox VM IP address first; if it doesn’t work, then use your local machine’s “regular” IP address. The first two lines are the how the debug breakpoint is set. Note that this means the code you want to debug must be modified by adding these two lines! 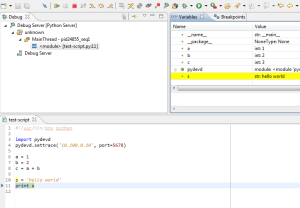 These two lines basically connect to the remote debug server (running on your local machine) and allow control through the LiClipse user interface. Note that this is very much different from Java remote debugging, where you don’t need to modify the target code. After running this, you should see the Debug Server show the thread and script in the Debug view. You can now step through the code and inspect the variables. The buttons at the top of the screen are for Step Into (F5), Step Over (F6) and Step return (F7). If you’re familar with debugging, these should make sense. You can click the Resume/F8 button at any time to return control to the program, and it will execute normally. Now that you’ve debugged a simple Python script remotely, let’s move onto the Swift code. Unfortunately, there is another change we need to make to Swift code before we can debug into the code. The PyDev debugging does not play well with green threading, so we’ll need to temporarily disable that in order to get debugging to work. This is obviously not an optimal solution, but I have not yet found a better way around this. 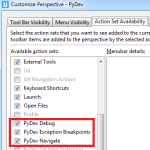 # TODO: Disabling eventlet green threading to allow for PyDev debugging to work. This disables green threading. If you don’t do this, the remote debugging will not work properly. You should see Debug Server show the call/stack trace in the Debug view, as well as the line in StaticLargeObject.__call__() highlighted where the remote breakpoint was hit. You will have to hit “Resume”/F8 a whole bunch of times to get through the test, since this method is invoked many times because it’s in the request pipeline. Unfortunately, if you disconnect the debug server before resuming, Swift may hang and you’ll have to run swift-init main restart to get things back to normal. Because of this, you’ll want to set breakpoints to very specific areas of code so you don’t have to resume too many times like in the example above. I have not yet found a way to set conditional breakpoints, i.e. breakpoints that only fire when a variable has a certain value, but being able to do this would help. Remote debugging in Python is a little more involved, but well worth the effort as it can offer much more insight into why something bad is happening, versus the alternative of just putting a bunch of logging statements everywhere. Please leave a comment below if you have any suggestions for improvements. Thanks for reading!